Fennel Mediterranean Herb Fennel is a gorgeous Mediterranean perennial herb with a delicate aniseed flavour and is often used in Mediterranean dishes. The stalks and leaves can be used in salads or as a garnish, the swollen leaf base (bulb) is eaten like a vegetable, and the seeds are used for flavouring. Fennel is a gorgeous Mediterranean perennial herb with a delicate aniseed flavour and is often used in Mediterranean dishes. Fennel (Foeniculum vulgare) plays an important role in the food culture of many European nations, especially in France and Italy. Its esteemed reputation dates back to the earliest times and is reflected in its mythological traditions. Greek myths state that fennel was not only closely associated with Dionysus, the Greek god of food and wine, but that a fennel stalk carried the coal that passed down knowledge from the gods to men. 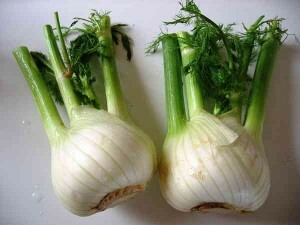 Fennel is composed of a white or pale green bulb from which closely superimposed stalks are arranged. 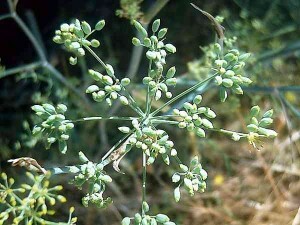 The stalks are topped with feathery green leaves near which flowers grow and produce fennel seeds. The bulb, stalk, leaves and seeds are all edible. The fennel bulb is used like a vegetable and adds nuanced flavouring to all kinds of foods. Fennel belongs to the Umbellifereae family and is therefore closely related to parsley, carrots, dill and coriander. 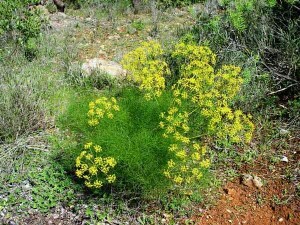 Fennel’s aromatic taste is unique, strikingly reminiscent of liquorice and anise, so much so that fennel is often mistakenly referred to as anise. Fennel’s texture is similar to that of celery, having a crunchy and striated texture. Fennel is an easy herb to grow for any beginner gardener and is generally problem-free. It thrives in hot, dry climates, but will grow in nearly all garden climates. Once the bulb has started growing, a few days of hot temperatures can cause it to bolt, or start producing seed instead of bulbs and stems, so good timing is the key. 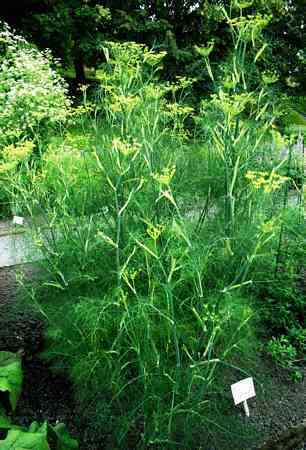 For growing fennel in warm climates, plant in autumn. For growing fennel in colder climates, plant in the spring. This herb is very forgiving when it comes to soil pH, but grows best when the pH is between 6.0 and 7.0. Prepare the garden bed before planting by digging in compost and well-rotted manure. For success in growing this vegetable, make sure that its garden bed is well-drained. Fennel grows up to 5 feet (1.5 m) tall so consider the best location for them when planning to add fennel to your garden (you may wish to plant it at the back). Also, since it is a perennial, you will want to plant it in an area that is convenient for allowing it to stay in that gardening location. Fennel has a reputation for hindering other plants’ growth, so place your fennel patch in an isolated location. 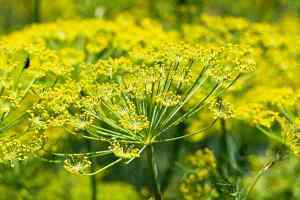 It typically does not do well with other vegetables and should never be planted close to dill as fennel and dill will cross-pollinate and in this case neither herb will be fit to eat. However, fennel does not have to be planted by itself. To add a splash of colour and add to culinary delights of fennel, consider planting mint, nasturtiums, and marigolds alongside the fennel. Fennel is a sunshine lover, so pick a sunny location. Plant the seeds 1-2 inches (2.5-5 cm) deep and lightly cover with soil. It will take the seeds 10 to 14 days to geminate. Be sure to keep them moist until they germinate and watch that soil doesn’t dry out completely during hot spells. Once germination has occurred, start thinning the plants out so that there are about 12-20 inches (30-50 cm) separating each seedling. Check soil moisture often and water accordingly. Fennel does not like it soggy, but it also does not like it dry. Fennel can also be planted in a container. When planting in a container choose a large one and do not plant too many seeds. Fennel is ready to harvest in stages. It needs about 70 days to produce a good size bulb, while young greens/fresh leaves can be picked anytime during the growing process. The seeds need to be harvested just before the seed heads turn completely brown. Simply place them in a paper bag and hang upside down in a cool, shady place. As the seeds dry, they will fall into the bag for collection. Fennel not only tastes good, but it is also a good way of attracting beneficial insects to the garden. These include, among many others, bees, ladybirds and butterflies. Fennel is a host plant for swallowtail butterflies, so do not kill the larvae you are sure to find munching on the leafy fronds. The leaves will grow back. 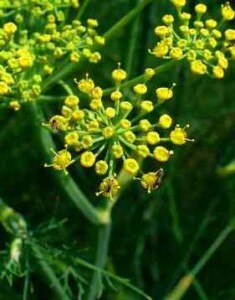 Fennel is also known to repel fleas in the yard and can be found planted around many kennels due to this fact. Premier Seeds Direct HRB16 Herb Fennel Florence Foeniculum Vulgare Seeds (Pack of 1000). Sow in mid spring to late summer in shallow drills 18 inches apart. 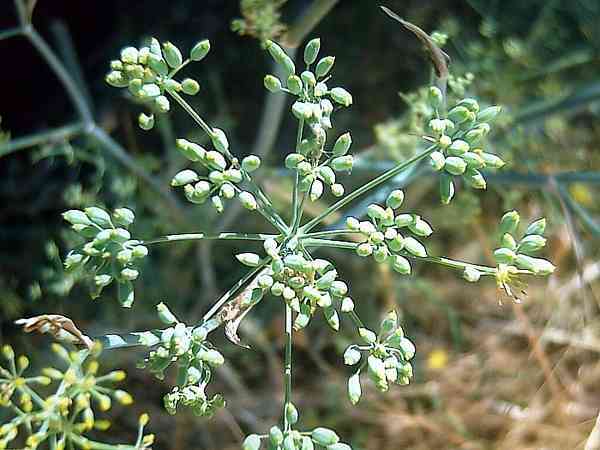 It is best to sow Florence fennel seeds successively in small quantities. Keep the plants well watered. When the bulbs begin to swell to about 2 inches in diameter, earth them up. Cut and use Florence fennel about 3 weeks after earthing up. Professional DEFRA licenced (07274) Quality Seed Supply only – Minimal packaging – Ziplock labelled bags. Some plants do not like to grow beside Fennel. I love Fennel on grilled fish. 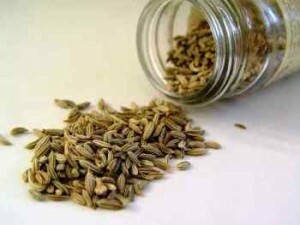 46,50,8,36,photo size 50,18 rich,16,Fennel Mediterranean Herb. Fennel The Herb Gardening in Spain.There is no such thing as too much fennel in the garden. Spain Info Fennel Mediterranean Herb San Francisco De Asis, Urb Marina, San Fulgencio, 03177, Alicante, Spain. 38n21, 0w29.